The Sweeney Colliery was sunk by Thomas Ireland & Co about 1836 and is shown on the 1837 OS just to the right of the Oswestry to Llanymynech road (the current B5069) at GR 32893274). The pit was leased by Edward Croxon in 1842 who had also acquired the lease to Drill Colliery a short distance north west, from Thomas Ireland & Co. The coal seams worked by the Sweeney shafts were Rover at 419 feet, Black Shale at 435 feet, Upper Four Foot at 477 feet and Thick or Six Foot at the foot of the shaft, 499 feet. The Sweeney pit was however prone to flooding and from the mid 19th century the coal seams were worked from Drill Colliery. The brickworks on the site however continued in operation using the colliery shafts to raise clay. 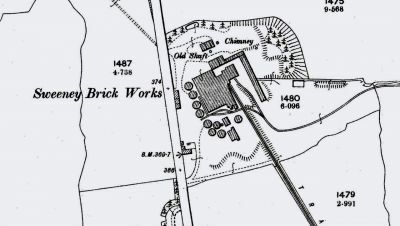 Production of firebricks and decorative tiles was undertaken at two other local brickworks associated with collieries, Trefarclawdd by 1851 and Trefonen by 1859 but shortly after that time production was transferred to Sweeney. In 1872 the brickworks lease was put up for auction by the Sweeney estate landowner, Stanley Leighton (1837 - 1901) as a going concern, but withdrawn and acquired by the Oswestry Coal & Brick Co Ltd who were operating the Drill colliery and brickworks. The 1875 OS map shows the works with four circular kilns and two shafts but no tramways. Prior to 1880 the lease was with the Sweeney Brick Co Ltd but at the EGM on the 27th September 1889 the company resolved to be voluntarily wound up with Robert Kay of Oswestry, Manager of a Brick and Tile Works appointed as Liquidator but he resigned from this role late in 1890. The lease was acquired by Kay & Hindle Ltd (no doubt the same Kay) who traded as the Sweeney Brick and Terra-cotta works. 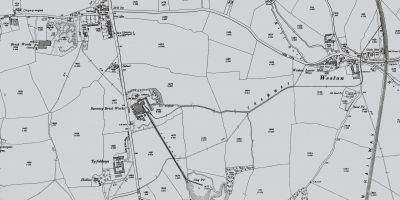 During the tenure, considerable expansion was undertaken and the 1901 OS map, surveyed a while earlier, shows nine circular kilns along with a tramway running some 250 yards south east from the works to an open pit worked for red boulder clay along with a longer , almost three quarter mile tramway taking a winding route from the works following field boundaries to Weston Wharf alongside the Cambrian Railways just north of the goods shed at Weston, but it is not known when the tramways were built. TRAMWAY TO CLAYPIT. Tramway and gantry extending to the top floor of the Mill House for hauling clay. Also a large Tip Wagon and 400 yards of 5/8 inch rope. TRAMRAILS. Double set of Tram Rails to all kilns with turntables, also a quantity of loose Tram Rails about the works. TRAMS. 4 wood trams for taking coal around kilns and boilers. RAILWAY SIDING. Main line siding Cambrian Railways Weston Wharf to Works containing 240 rails and two crossing, lengths of rails about 2,400 yards, 55lb to the yard. 1300 yards (probably the siding length). An agreement was made on the 25th September 1911 to form a new company to work Sweeney Brickyard, the Memorandum and Articles of Association date the incorporation to the 11th December 1911 and on the 19th December 1911 the above inventory was annotated "Recd of the Sweeney (Oswestry) Brick Co Ltd £1500 in full payment". Again life was short, at an EGM held on the 20th September 1915 the company agreed to be voluntarily wound up. R>D>Thomas notes the final owner as the New Sweeney Brick & Tile Co Ltd, but there is no confirmation and it is uncertain if the brick works was again operated, certainly by 1926 all was closed. Common bricks of nearly white colour and firebricks, tiles, etc were made at the works from two mined fireclays, whilst bricks of other colours were produced by mixing these clays with the red clays of Ruabon Marl, initially mined but latterly extracted from the open pit. The guage of the narrow guage tramways is not known but a wheelset with wheels with five curved spokes has been found close to the route of the tramway. 1901 map showing the two tramways, one leading from the claypit into the brickworks. This tramway, as it entered the brickworks site, became elevated and entered the building on the upper floor.. The other tramway travelled from the Cambrian main line at Weston Wharf to the brickworks. This went under the elevated tramway stopping at two brick kilns. A set of wheels, found under a hedge alongside the tramway leading to the Sweeney Brick works. 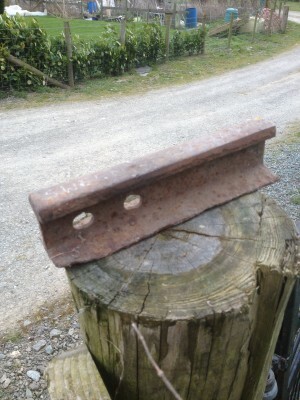 A piece of rail from the track bed of the tramway from Sweeney Brickworks dug up at Weston Wharf.